Arnold Schwarzenegger has revealed that the upcoming Terminator 6 will ignore the events of Terminator: Genisys completely, and also that Linda Hamilton has already started her training regimen to get back into Sarah Connor shape. There's been a lot of news coming out of the Terminator camp lately and fans couldn't be more excited about the prospect of director Tim Miller (Deadpool) and producer James Cameron collaborating to take the Terminator franchise (hopefully) back to its roots. Schwarzenegger recently appeared in Birmingham, England for the Experience with Arnold Schwarzenegger convention where he gave away some more details about the upcoming reboot. 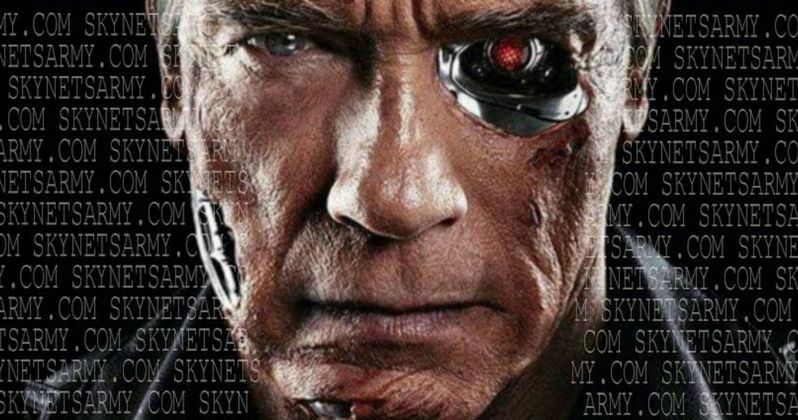 A representative from TerminatorFans.com was on hand for the Arnold convention and has reported that, according to Arnold Schwarzenegger, Terminator 6 will completely ignore the events of Genisys. The actor also hinted that the new reboot will be a sequel to the classic Terminator 2: Judgement Day, which would also mean that Terminator 3 and Salvation will be ignored as well. This is definitely a step in the right direction for the franchise and fans should be excited to see what's up next for the Terminator series. In addition, Schwarzenegger also commented on Linda Hamilton's return to the Terminator franchise, mentioning that she had already started her training to prepare for portraying Sarah Connor for the first time in 26 years. James Cameron announced earlier this week during a special screening of Terminator 2 that Hamilton will be returning to reprise her role as Connor, the mother of John Connor, the leader of the worldwide human Resistance. While mentioning that Hamilton will return, Schwarzenegger brought up that Robert Patrick will not return as the T-1000, even though fans have been waiting for a return of the popular T-1000. Finally, Schwarzenegger announced that he should have a finished script in roughly 2 weeks and that it was penned by James Cameron. In addition, the actor revealed that filming will begin in March of 2018. Cameron recently announced the official return to Avatar 2, so it seems that the director/writer/producer will be serving some double duty for two highly anticipated projects that will surely take over his life. Cameron himself has said that the Avatar sequels alone will take up the next 8 years of his life. Arnold Schwarzenegger has just revealed quite a bit about the upcoming Terminator 6 project and fans should be happy that the project is moving full steam ahead after years of missteps. Though the majority agree that Genisys was poorly executed and just not that great, there will definitely be a faction of fans who will be bummed out that the franchise has chosen to ignore the movie as well as the previous ones as well. However, James Cameron is back on board and the project is in the good hands of Tim Miller, which should give the new Terminator reboot a perfect blend of new blood with the original spirit of the first two movies. This is a developing story and more news is expected to be announced soon.